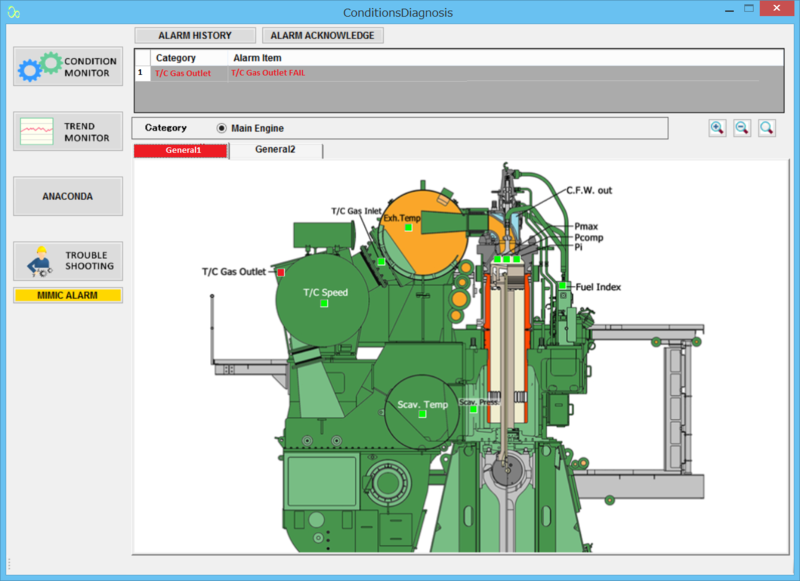 ClassNK has commenced verification tests of its next-generation condition-based monitoring (CBM) system ClassNK CMAXS e-GICSX for Mitsui’s MAN B&W engines. The system is being jointly developed by ClassNK, Mitsui Engineering & Shipbuilding Co., Ltd., and MES Technoservice Co., Ltd. and the verification test is being conducted on a MOL-managed vessel with the cooperation of Mitsui O.S.K. Lines. ClassNK CMAXS e-GICSX, based on voyage data, including weather and sea condition and machinery data collected from multiple sensors installed on the engine, can detect machinery abnormalities and, based on abnormality detection results, provide troubleshooting that can be accessed onboard even without an internet connection. ClassNK CMAXS e-GICSX uses an algorithm to analyze correlations between multiple sensing data. Through the use of this algorithm, precise abnormality detection is carried out based on voyage data and large amounts of data collected from the electronically controlled diesel engines. A total of three vessels from shipping companies including MOL Group have been installed with ClassNK CMAXS e-GICSX and the effectiveness of the abnormality detection results and troubleshooting function will be verified. The verification test will go on until spring 2016. ClassNK will provide a system to increase the reliability of machinery and support a reduction in lifecycle costs. The next-generation condition-based monitoring system (ClassNK CMAXS) uses big data analysis technology and includes ClassNK CMAXS e-GICSX for Mitsui’s MAN B&W engines. ClassNK will also work together with machinery manufacturers to carry out a streamlined verification of the application of ClassNK CMAXS through vessel engine inspections.